Snug in her bed, Tabitha waits and searches and listens for sleep. Her bed is cozy. Her room is dark and quiet. Her favourite things surround her. She should be able to drift off to sleep with no trouble, but something is missing. What could it be? Tabitha's imagination takes over. One by one, the things that she cherishes offer to help her. Will the whale lull her to sleep? Can the eagle carry her to dreamland? Or the horse? The frog? The rabbit? One by one, Tabitha considers and then rejects their aid. Sleep comes in the end, as it often does, from an unexpected place. How Sleep Found Tabitha is a delightful bedtime story for reluctant sleepyheads who will want to hear it over and over again. Sheena Lott’s watercolours add layers of wonder to Maggie de Vries’s spare, poetic text. Sheena Lott has illustrated a number of popular picture books, including Midnight in the Mountains, Going to the Fair and the perennial bestseller Jessie's Island. She is also an award-winning artist whose vibrant watercolours, often featuring children and seascapes, are highly sought after. Sheena lives outside Victoria, BC, & paints in her home studio overlooking the sea. In How Sleep Found Tabitha, one after the other, Tabitha's bedside toys invite her to sleep in their preferred habitat. Each invitation takes the form of a rhyming couplet. None of the creatures' sleeping places is right for a small girl, however, and when sleep finally comes (unexpectedly as it so often does), it is in a surprising yet familiar form. Author Maggie de Vries co-wrote the 1991 mixed-up fairy tale picture book, Once Upon a Golden Apple, with Jean Little, and last year she had a chapter book entitled Chance and the Butterfly published by Orca. 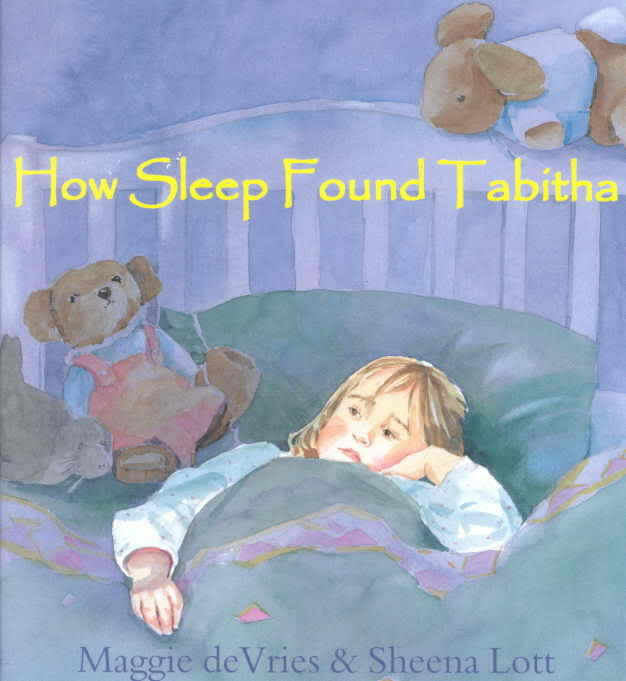 The gentle, rhythmic text of How Sleep Found Tabitha will be appreciated as a bed-time story by readers and young listeners. It is a simply written, repetitive sort of story that children will want to hear read again and again. Award-winning artist Sheena Lott's vibrant watercolours bring the small insomniac and her surroundings to life perfectly. Her double page paintings depicting each toy in its real-life form (for example, the whale in the sea, the eagle on its nest, the frog on its lily pad) are irresistible. A nice touch by the artist is the inclusion of a certain bedtime story lying on the rocking chair in Tabitha's room. It is clear to the reader that the story is Jessie's Mountain, a well-loved picture book illustrated by Lott which was published several years ago. How Sleep Found Tabitha will be enjoyed by listeners from 4 to 7, and it would be of particular value to preschool and kindergarten classrooms whose schedules include a nap or rest time. Young listeners will certainly enjoy the rhymes and the surprise ending. Teachers wishing to stimulate imaginative discussion and/or writing among their primary grade students should find the book a valuable read-aloud.